This web page is adapted from an online lecture delivered as part of a general first year university Petrology module. It serves as an introduction to this topic. Links and references have not yet been fully updated. 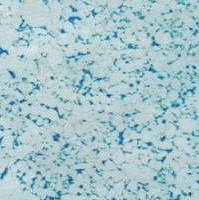 Diagenesis refers to the physical and chemical changes which take place after the deposition of a sediment. BOGGS, S. 1995. Principles of Sedimentology and Stratigraphy (2nd edition). Prentice Hall. TUCKER, M.E. 1991. Sedimentary Petrology (2nd edition). Blackwell. Porosity is an aspect of texture which is of particular interest to the economic geologist, because it is in the pore spaces that economically valuable fluids such as oil, gas or water may be contained. Primary porosity is formed at or before the time of deposition: it occurs between and within the grains. Secondary porosity is formed during diagenesis, usually by solution/dissolution of components of the rock. The images in the left hand column show thin sections of two sandstones which were impregnated with blue resin, to show up the porosity. Close-ups of each are seen in the centre column. The sections are taken from core 25 mm in diameter. 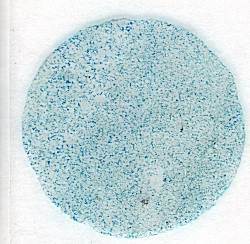 Estimate the percentage porosity for each of the thin sections. Both primary and secondary porosity are progressively destroyed as sediments are buried, mainly by processes of compaction and cementation. 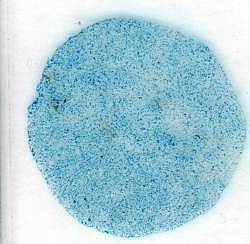 When describing a thin section, estimate the percentage porosity, and try to distinguish whether it is primary or secondary. The diagram (after Taylor, 1950) shows the various types of grain contacts found in sandstones. You will often find more than one type in a single thin section, but are unlikely to find all four types together. Grain contacts start off as tangential (point) contacts. As the sediment is buried and compacted, grains are rotated and pushed closer together, and pore space is reduced: long contacts become common. 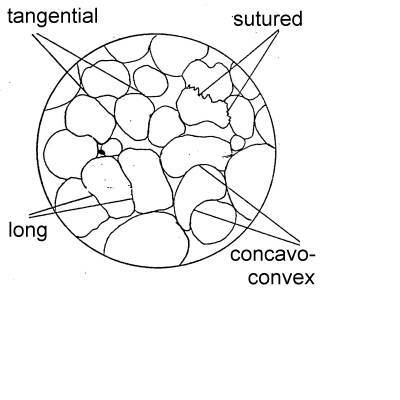 With further compaction, softer grains are compacted around harder ones, and grains start to dissolve in the pore waters at their contacts (grain contact dissolution*): concavo-convex contacts become important. As grain-contact dissolution continues, grain boundaries become irregular or sutured, and original grain shapes are destroyed. Eventually all the contacts are sutured, and all the porosity is destroyed. *grain contact dissolution is a form of pressure solution. The grains dissolve at their contacts due to overburden pressure during burial. The often large volumes of material may later be precipitated as a cement elsewhere in the system. Destruction of porosity occurs, first of all, by rotation and closer packing of the grains; then, as burial progresses, by deformation and dissolution of the grains. 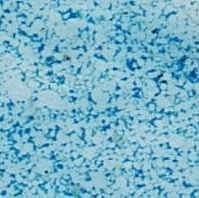 chemically precipitated material, whether a new mineral, or an addition to an existing mineral, may form a cement, which binds the grains of the sediment together to form a rock. 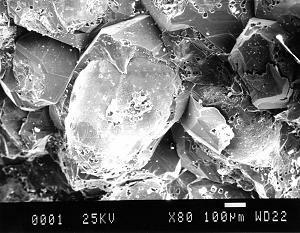 Cement is (usually) crystalline material precipitated in pore spaces from solution. Very commonly, quartz cement grows as a continuation of the original quartz grain. Together, the grain and cement form a single crystal, although the two parts of the crystal have very different ages. These are syntaxial quartz overgrowths.